I'm not sure if you've heard the news, but Facebook is officially getting super-creepy. Facebook announced Tuesday that it will be implementing facial recognition technology for all users in the next few weeks, semi-automating the photo-tagging process. Sure, you can "opt-out" of the service, but it's a pretty weak consolation. After all, opting out won't keep Facebook from gathering data and recognizing your face--it'll just keep people from tagging you automatically. The new facial recognition technology, which was announced in December but only introduced to a small test group, is basically Facebook's way of creating a huge, photo-searchable database of its users. And yes, it's terrifying. 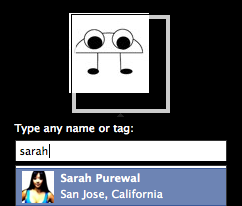 Basically, Facebook is using facial recognition technology to "suggest" tags to users who upload photos. In other words, if I upload six photos of my friend Kaitlin, Facebook may "recognize" her face (thanks to other tagged photos of her on the website) and "suggest" that I tag her in those six photos. This makes the tagging process a little easier for me--after all, aren't I more likely to tag Kaitlin if all I have to do is click a button that says "yes, tag away"? Another "benefit" is that I can tag all of these photos of Kaitlin at once--as Facebook said in a blog post, isn't it a whole lot better to be able to tag all of those photos of Kaitlin at once, instead of having to tag each one individually? Sure, I guess it's easier. Easier for Facebook to invade my privacy, that is. - Facebook has 600 million members. - Each day, Facebook's members upload over 200 million photos, and Facebook currently hosts over 90 billion photos. - Each time you "tag" a photo on Facebook, its facial recognition technology learns more about what that person looks like. - Even if you happen to "opt out" of the facial recognition tagging, Facebook's technology can surely use the tagged photos of you (hey, perhaps even the tagged photos of you that you end up un-tagging) to figure out what you look like. - Right now Facebook is using this technology to help people tag photos. But once they have an accurate facial recognition database of several hundred million people? Hmm. At the end of the day, Facebook's facial recognition technology is downright creepy. Opting out of the service doesn't mean Facebook will stop trying to recognize your face--it just means that Facebook will stop suggesting that other people tag you. Even Google has noted the utter creepiness of facial recognition technology (though I suspect they're just waiting for Facebook to get burned). Facial recognition technology will ultimately culminate in the ability to search for people using just a picture. And that will be the end of privacy as we know it--imagine, a world in which someone can simply take a photo of you on the street, in a crowd, or with a telephoto lens, and discover everything about you on the internet. Obviously, we can't stop the world of technology from moving toward the development of accurate facial recognition software. But so far, no facial recognition software has really been a threat to our privacy, because nobody has that huge database of people and photos required. Oh wait, except Facebook totally does. Yeah. So not only should you opt out of Facebook's facial recognition technology by going to Account > Account Settings > Privacy > Customize Settings > Things Others Share and disabling "Suggest photos of me to friends," you should also upload random pictures of trees and animals and stuffed toys and tag them as yourself.